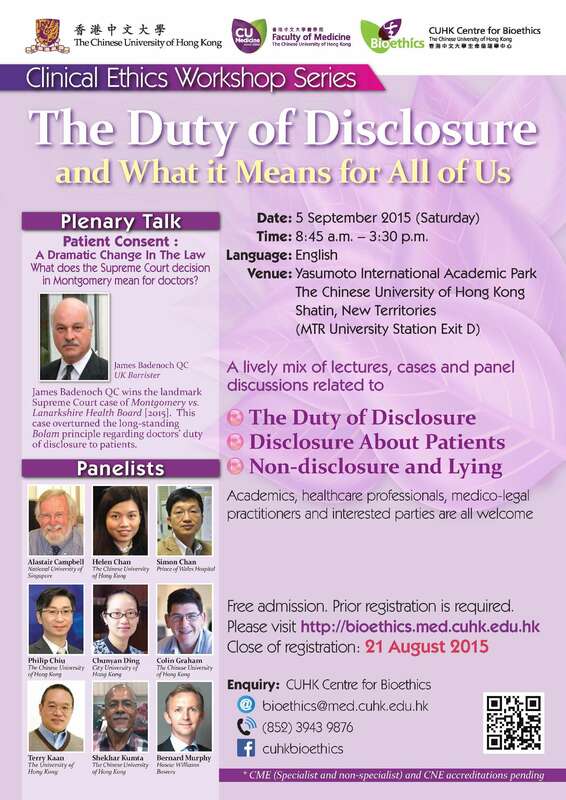 Following the launch of the First Annual Summer Workshop last year, we are delighted to present to you the upcoming Clinical Ethics Workshop Series and its inaugural workshop, The Duty of Disclosure and What it Means for All of Us. The series will cover a broad spectrum of ethical issues that the frontline healthcare community, medico-legal practitioners and ethicists are likely to encounter day by day in their duties and working environment. We are very honored to have Mr. James Badenoch QC to deliver a plenary talk on Patient Consent: A Dramatic Change In The Law – What does the Supreme Court decision in Montgomery mean for doctors? and share his court case in victory to overturning the Bolam principle about the doctors’ duty of disclosure. The workshop comprises a lively mix of lectures, cases and panel discussions to discuss and challenge the ethical, legal and regulatory framework underpinning required professional behaviors. Academics, healthcare professionals, medico-legal practitioners and interested parties are welcome! FREE ADMISSION. PRIOR REGISTRATION IS REQUIRED. Is Lying to our Patients Acceptable? Stay tuned with the Centre's upcoming workshops!